Published in August 1991, the author tested Leslie Van Houten for the original trial, and testified in her second and third. He also claims to have thought up the idea to change her charge to Robbery Homicide so a diminished capacity defense couldn't be used. "As a forensic scientist, Dr Markman is often alone in a room with someone who has killed - sometimes without provocation or apparent motivation. After lengthy interviews and evaluations, his findings determine the degree of a murderer's responsibility at the time of the crime and thus influence his sentence in court. This is Markman's analysis of some of his toughest cases, including two of Charles Manson's followers, Marvin Gaye's shooting by his father, the infamous "Vampire of Sacramento" and Norma Jean Armistead, who wanted a baby so much that she was willing to kill for it. 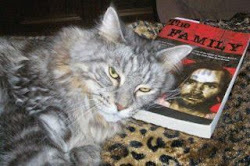 The book should appeal to everyone who has a morbid fascination about murder and wants to know more about the people who have killed." Submitted by Chris! Thanks Chris! Thanks Chris! It is really interesting! It gives a lot of detail of Leslie's life during her teenage years... I didn't know a lot of that stuff! Mine has a different cover on it. I haven't read it years. I'll re-read it. 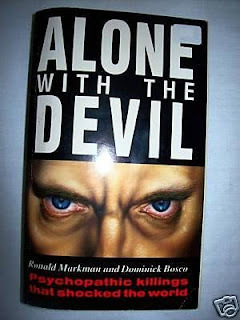 I'm in the middle of "Charles Manson's Blood Letters-Dueling With the Devil" by Richard Rubacher now. Interesting post, thanx. I can't hardly imagine Leslie Van Houten playing a sousaphone. I think it said she and a few others joined the SRF in Pacific Palisades, apparently that is still in operation, their webpage is HERE. Leslie's father was supposedly an alcoholic. I wonder how much that played into her life? It is very difficult to understand why a girl who was the 9th and 10th grade cutie pie ended up in the 20th centuries most notorious murder cult. Between the age of 15 and 20 her life was a fast paced series of changes which should have enabled Leslie to mature quickly but she never learned fron her mistakes. Leslie will quite possibly serve 20 more years in prison. Ya know from my own life experience- I can take a stab at that Poirot. I grew up a cops kid with not much, but I did grow up in Princeton. I saw many, many wealthy girls I went to grade school wind up hanging out with looser guys in high school. I watched many girls who were preppy, spoiled, little princess' grow up and start hanging around the "bad boys" and by there senior year in high school- you couldn't recognize them. and in my case that was a good thing lol :) I was no Saint back in the day. but the hard part for a smart young lady with a future ahead of her is to figure out which guys will mature and grow out of that phase, and which ones will be trouble forever. When a teenage girl is in love it can be hard to talk to her about the future lol unfortunately- LULU wasn't able to make that distinction. or maybe just maybe we give LULU too much credit and she was smart enough to know the difference and out of her own black heart- she just didn't care? I am not sure, but probably give her the benefit of the doubt of being young, stupid/drugged out, and just not able to know the difference. But I have seen parents do everything short of lock their daughters up and it didn't make any difference. They found a way to see who they wanted to see. Every one of us hits a time in our lives where we have to assume a small amount of personal responsibility. All of us have had choices to make at young ages and we all have lines we wont cross at a certain point. I have been very hard on bad parents in the past- but I acknowledge that there is only so much that parents can do without having 24 hour surveillance. Certainly single parents have it worse. But ask yourself how many kids from broken homes in the 60's got into drugs and ran away from home- but never hurt anyone. There are plenty of them out there, and the difference is that they did not have violence in them and our favorite felons did. was that there parents fault?? maybe... I am not sure- that's a bit above my pay grade. Hi Saint. Nice points. I can definantly see Leslie as doing the opposite her parents wanted. Her nickname was LuLu. Have you ever suspected that this was not a nickname of endearment? Just as Sadie Mae Glutz clearly had a mocking, insulting sound to it. Leslie was never real bright. Leslie derived aliases for her self that were grandiose but her friends called her LuLu. Leslie was a real LuLu. She was a 10th grade cutie pie but dropped out of society. She was a Front Street Girl yet ended up being a volunteer for the Labianca murders. There is a trend in Leslie's path from sage 15 to 19. She starts out real high in the pecking order but ends up slamming herself into the decks of aircraft carriers on purpose. It was Ouish or some other gal who said Charlie only sent the expendables.